As anyone who has ever filled out an Oscars ballot can attest to, watching events like the Academy Awards via TV is a rite of passage for women who love popular culture. As part of the POPSUGAR Insights Content, Culture, and Commerce study, we surveyed over 1,500 women between the ages of 18-44 and asked them to tell us which cultural events they watched on TV in the past year. Overall, 65% of women said that they watched a music award show in the past year, and 62% of women say that in the past year, they watched film award shows (like the Academy Awards, Golden Globes, or MTV Movie Awards) on TV. Major sporting events like the Super Bowl and World Cup were watched by 60% of women. 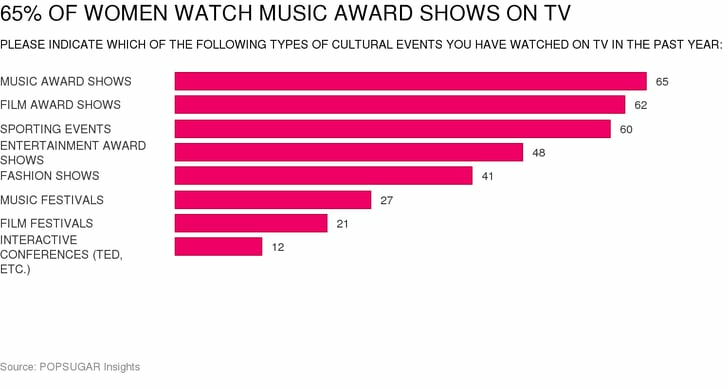 Beyond the top three cultural events, the most popular events to watch via television included entertainment award shows (like the Tony Awards, People's Choice Awards, or Emmy Awards) with 48%, followed by fashion award shows with 41%.